SYNOPSIS - Gavril Nagarian is believed dead. But the Lord Drakhaon of Azhkendir lives on. Now he is entrusted with a sacred mission: to rescue the kidnapped Magus, in whose possession are the five priceless rubies that compose the fabled Tears of Artamom. Ancient law decrees that whoever possesses the gems has the power to impose his law over the Empire of New Rossiya. But the task exacts to Gavril's soul - and to his life - as two deadly rivals unite in a common goal: to destroy Gavril and the Drakhaoul that lives within him once and for all. EXCERPT - "Where's Gavril Andar?" Raisa paced Minister Vashteli's antechamber. "One moment he's fighting the Tielens at our side. The next, he disappears." "Has Elysia Andar heard any news from her son?" Pavel asked. He noticed that a single lock of auburn hair had come loose from beneath Raisa's neat kerchief, giving her an endearingly distracted air. "Not a word. And just when we need his help..."
"Yes." Pavel was remembering the heart-stopping moment when he had witnessed the impossible and learned Gavril Andar's terrible secret. It would take a Drakhaon to spring Rafael Lukan from the Commanderie's clutches. FL Speak - The worst has arrived. 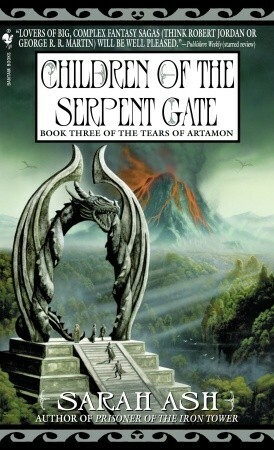 Eugene has let loose all the trapped drakhouls of the serpent gate. But what he didn't count on was the loss of his wife to the Francians who held her and their unborn child hostage. Meanwhile Gavril is in search for the kidnapped Magus and grave situations even brings enemies closer. Gavril and Eugene shake hands to defeat a third Drakhoul who has possessed the Francian Emperor. But before they could take the gather their wits, Oskar and Andrei, both possessed, whisk the crown of Artamom away in hopes of opening the Serpent Gate. Sarah Ash continues her story in a break neck pace as all the elements come down crashing to this finale. Eugene has always been the loveable bad guy but here, you actually love him despite all his flaws. For once, it feels Gavril is not the main character anymore. Though the way a Drakhaoul gets hold of a new character is almost irritating. Every time, the character is naive and believes he is meant for better glory. Although I believe, if I was that bloke, I would have felt the same thing. Eugene realizes his blunder of summoning the Drakhouls when his own daughter and child are kidnapped by the "evil" Drakhaouls. With no one to turn to, he begs Gavril for help as they team up not only to save the children from death, but also the entire world against the whim of the power ravaged daemons. A fascinating story comes to a deserving end. I must admit, despite the few flaws, I immensely enjoyed it. The concept of a vampire based daemon who needed the blood of pure girls in order to survive and be powerful which allows the daemon take control of the host with every kill was something worth reading.